When compared with the civilian world, commissioned officers in the U.S. Armed Forces are the equivalent of upper management and executives for the military. As such, commissioned officers are expected to exude leadership skills and have a well-rounded education. 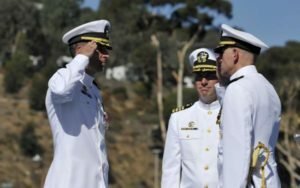 On the education front, all commissioned officers must have a four-year college degree. An officer’s education will help determine his or her career path, though the particular field of study is generally unimportant except in highly-specialized jobs. Senior Military Colleges provide a combination of higher education with military instruction. These institutions offer financial aid to eligible students. Although all cadets must participate in the school’s Reserve Officer Training Corps (ROTC) program, only cadets who received an ROTC scholarship are required to enter military service upon graduation. Military Service Academies fully immerse students in the military experience while providing a first-class education. Upon graduation, students earn a Bachelor of Science degree, are commissioned as officers in their respective service branch, and have an obligation to serve for at least five years. Military Service Academies are extremely competitive and require a congressional letter of recommendation, among other criteria, to attend. Tuition, books, board, and medical care are fully paid for all four years of college. U.S. Naval Academy in Annapolis, Md. U.S. Air Force Academy in Colorado Springs, Colo.
U.S. Coast Guard Academy in New London, Conn.
U.S. Merchant Marine Academy in Kings Point, N.Y. Offered at nearly 2,000 colleges and universities throughout the U.S., ROTC programs provide students with a paid college education and military training in exchange for the student’s commitment to serve for a set period of time. Officer Candidate Schools/Officer Training Schools (OCS/OTS) are available to civilians who want to serve in the military but have already received their four-year college degree. These schools vary in length depending on the branch of service, but typically last between nine and 17 weeks. Courses cover military training and leadership skills. Additionally, enlisted service members with at least 90 hours of college credit who want to become commissioned officers and Direct Commission Officers are eligible to attend. For highly-specialized professionals in the medical, law, religion, intelligence, and/or engineering fields, the military may offer a direct commission. These officers earn a higher entry salary due to their expertise and are typically required to attend an indoctrination or development school depending on which branch of service he or she joins. Additionally, some requirements, such as age limits, may be waived.